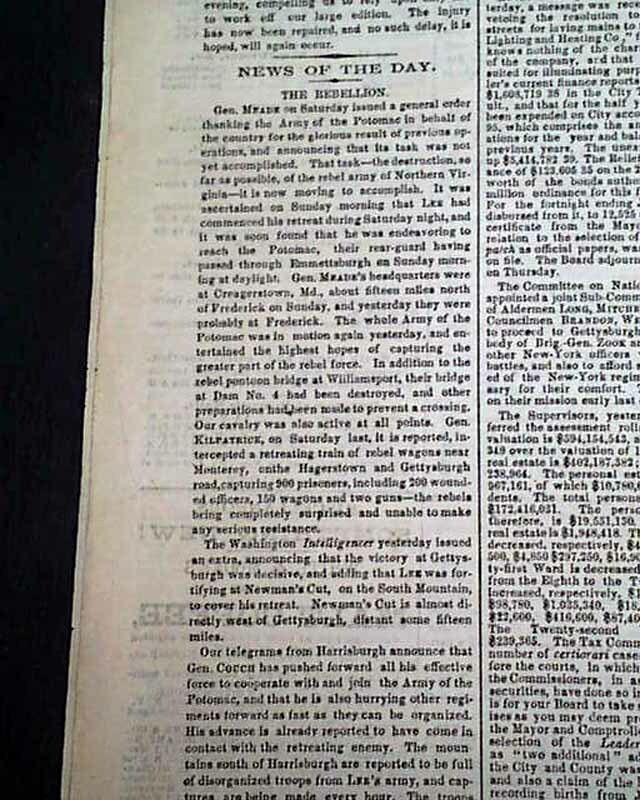 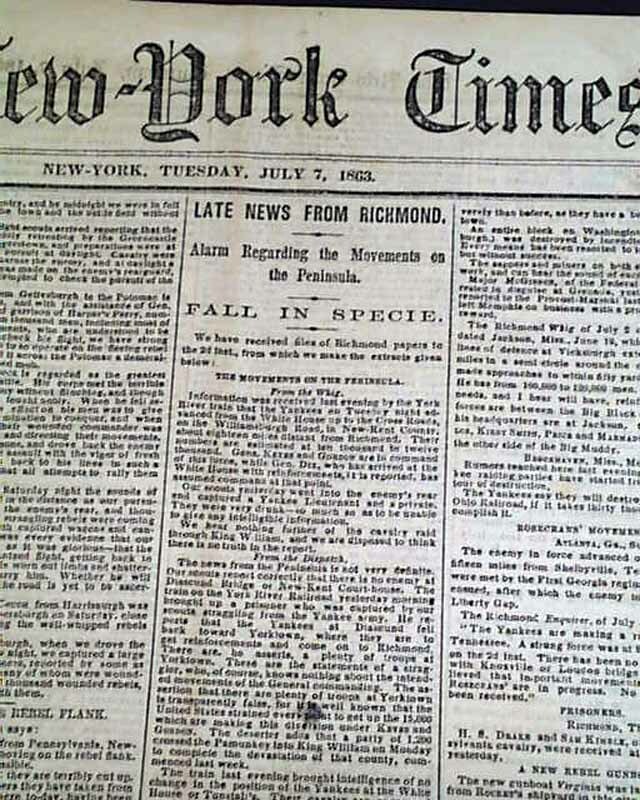 THE NEW YORK TIMES, July 7, 1863 This is a terrific issue on one of the most significant battles of the entire Civil War: the Battle of Gettysburg. 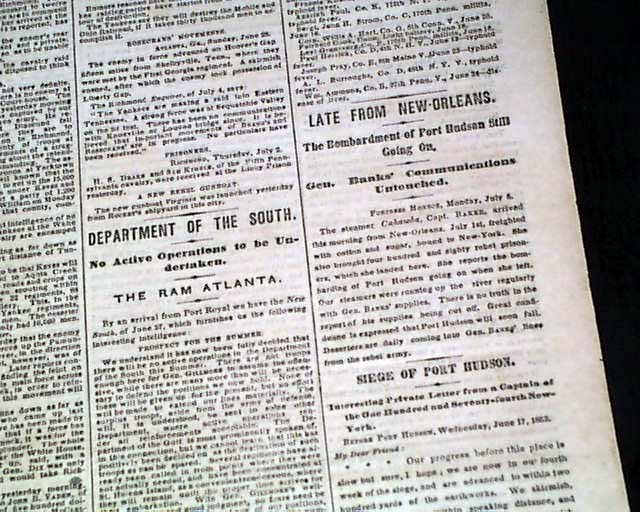 This issue was published just at its completion when it was established that the Yankees had succeeded in defeating the Confederates and causing them to retreat towards the South, never to threaten the Union forces in the North again. 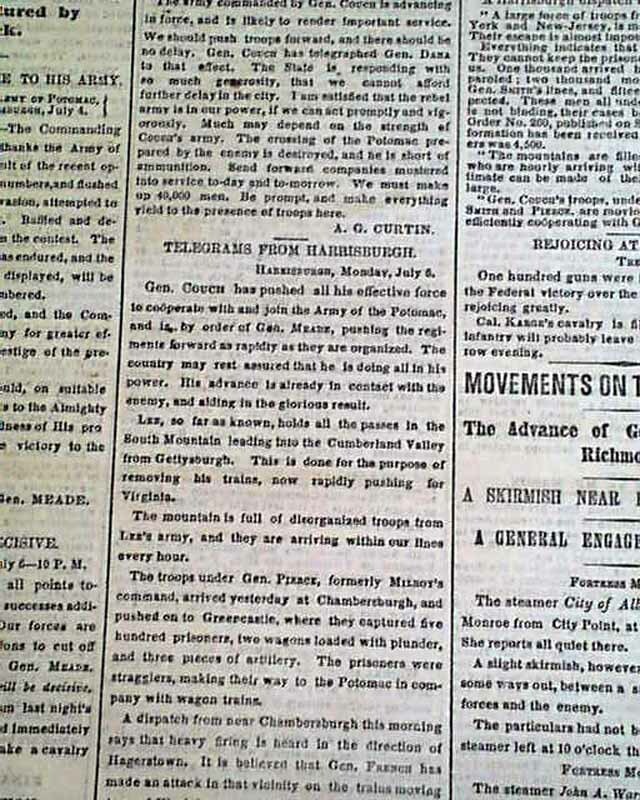 It was a turning point in the war which would lead to a Union victory less than two years later. 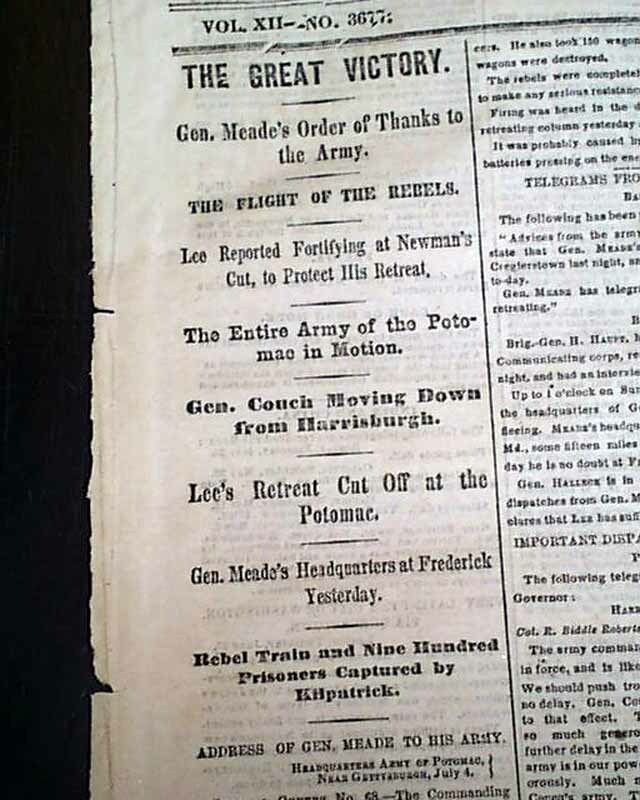 The first column has nice heads including: "THE GREAT VICTORY" "Gen. Meade's Order of Thanks to the Army" "The Flight of The Rebels" "Lee Reported Fortifying at Newman's Cut, to Protect His Retreat" "The Entire Army of the Potomac in Motion" "Gen. Couch Moving Down from Harrisburgh" "Lee's Retreat Cut Off at the Potomac" "Gen. Meade' Headquarters at Frederick Yesterday" "Rebel Train & 900 Prisoners Captured by Kilpatrick". 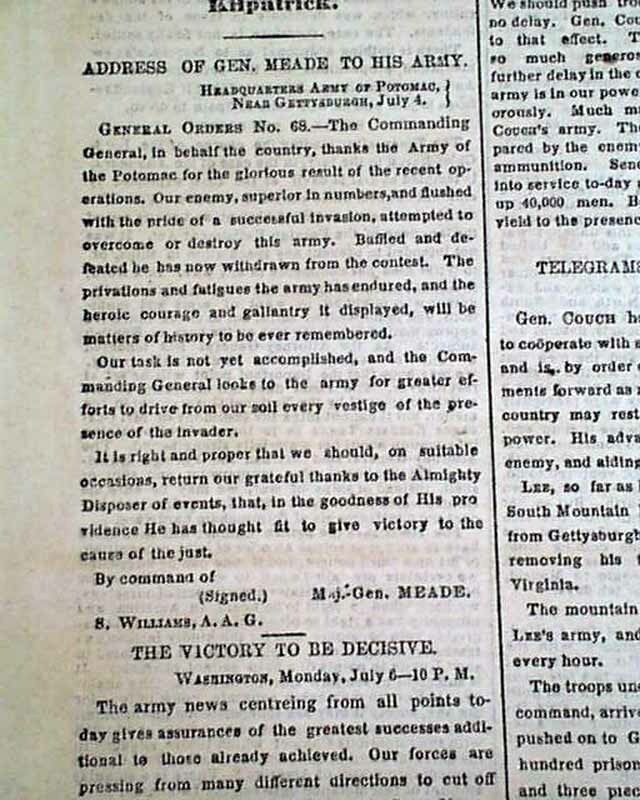 The very beginning of the text is Gen. Meade's official "General Order" to the troops in which he congratulates the forces for their victory at Gettysburg, including in part: "The Commanding General, in behalf of the Country, thanks the Army of the Potomac for the glorious result of the recent operations. 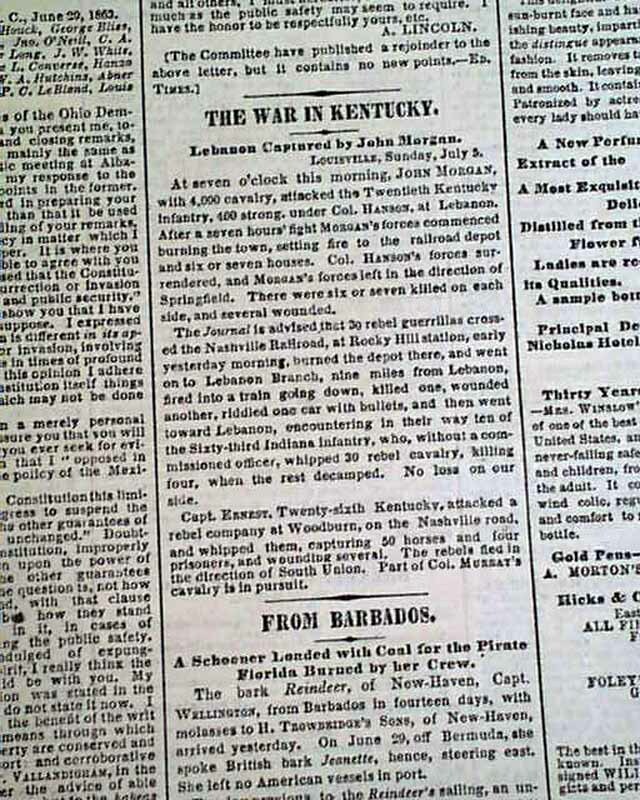 Our enemy, superior in numbers, and flushed with the pride of a successful invasion, attempted to overcome or destroy this army. 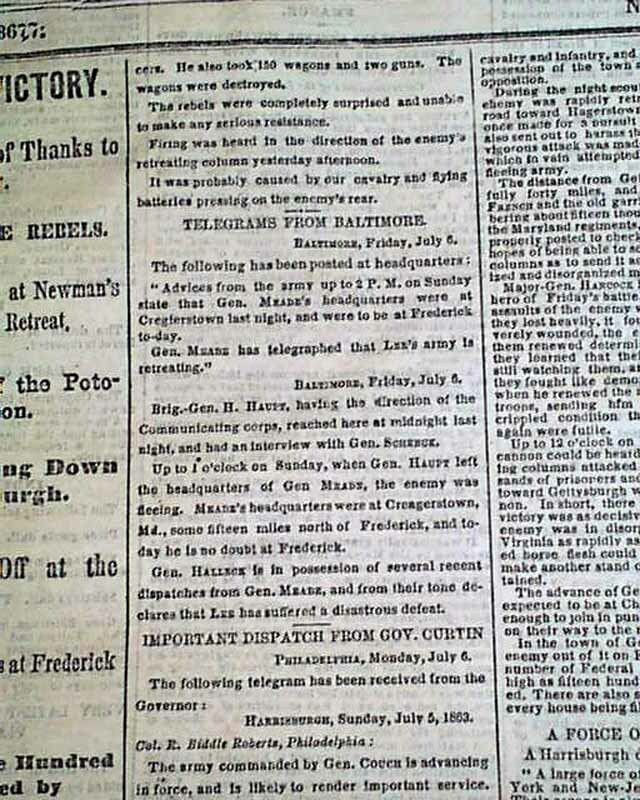 Baffled and defeated he has now withdrawn from the contest..." signed by him in type: Maj. Gen. Meade (see). 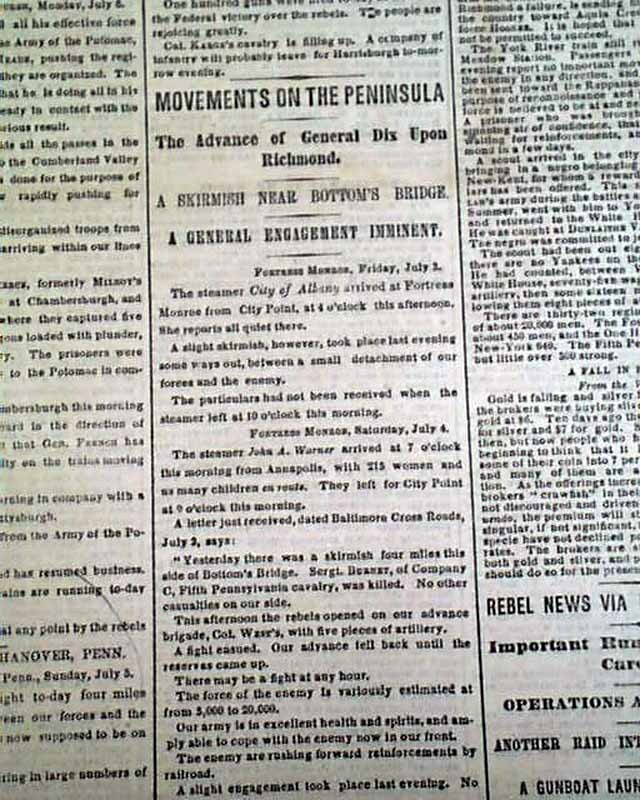 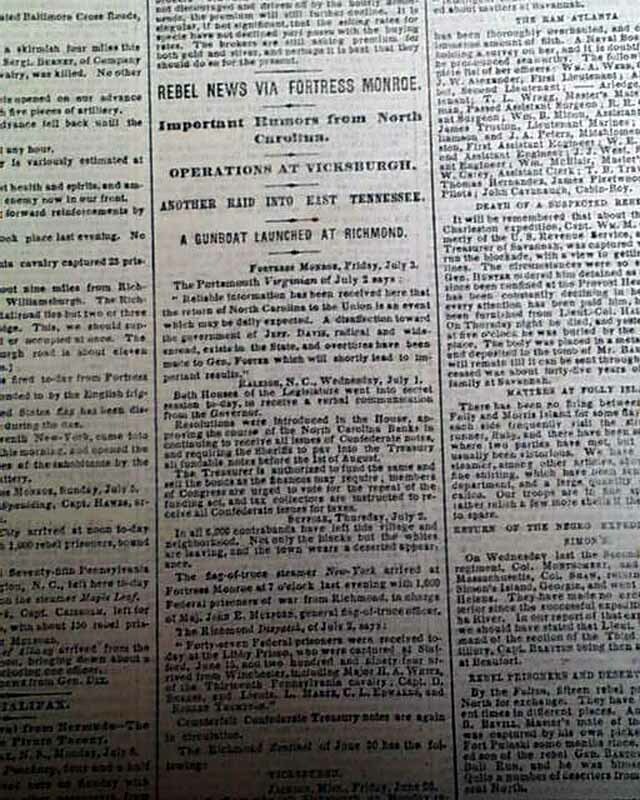 Among the many subheads on the front page are: "The Victory To Be Decisive" "Our Whole Army In Motion" "Telegrams From Gettysburgh" which begins: "The rebels have retreated toward the Potomac. 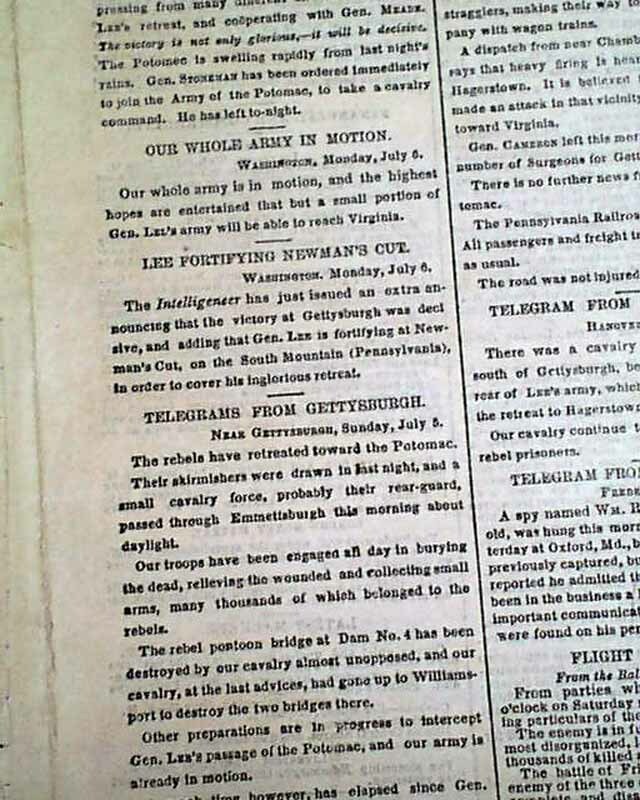 Their skirmishers were drawn in last night...Our troops have been engaged all day in burying the dead..." with more. 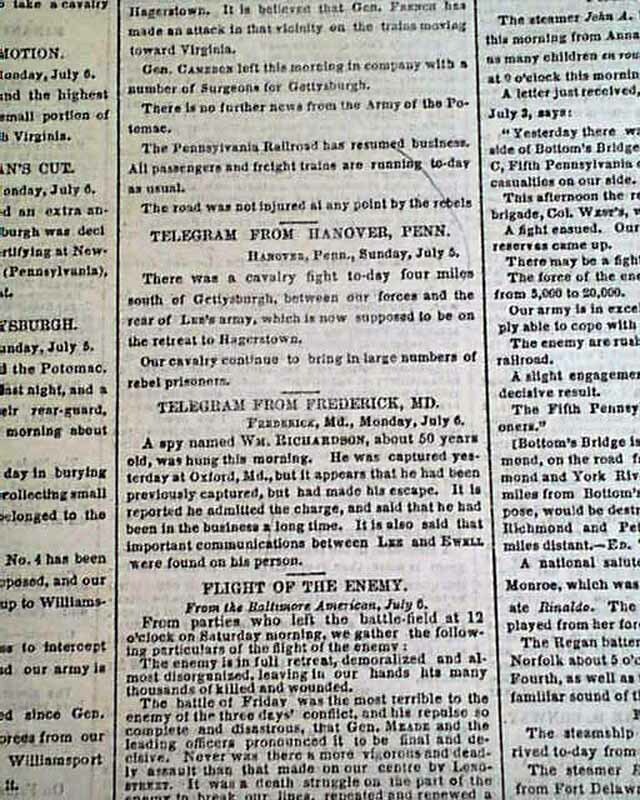 There is also a ftpg. 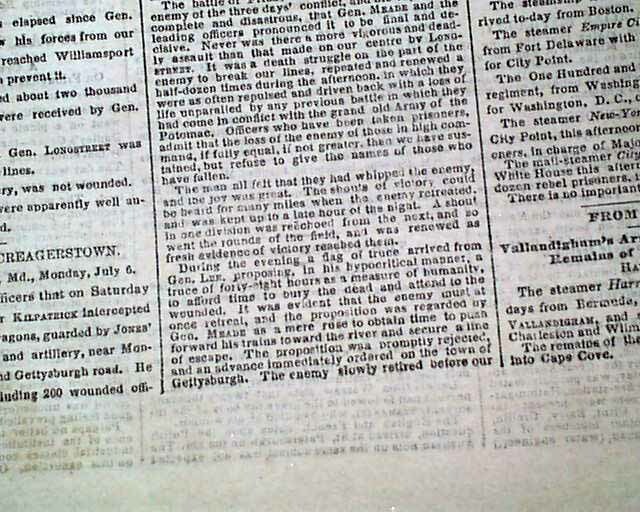 account of the battle headed: "Flight Of The Enemy" which begins: "The enemy is in full retreat, demoralized & almost disorganized...the battle of Friday was the most terrible to the enemy of the three days' conflict..." with more (see). 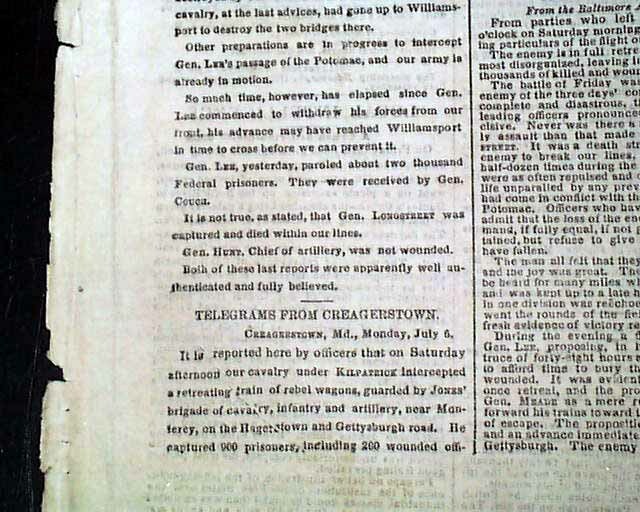 There is also various editorializing on the Gettysburg battle on page 4. 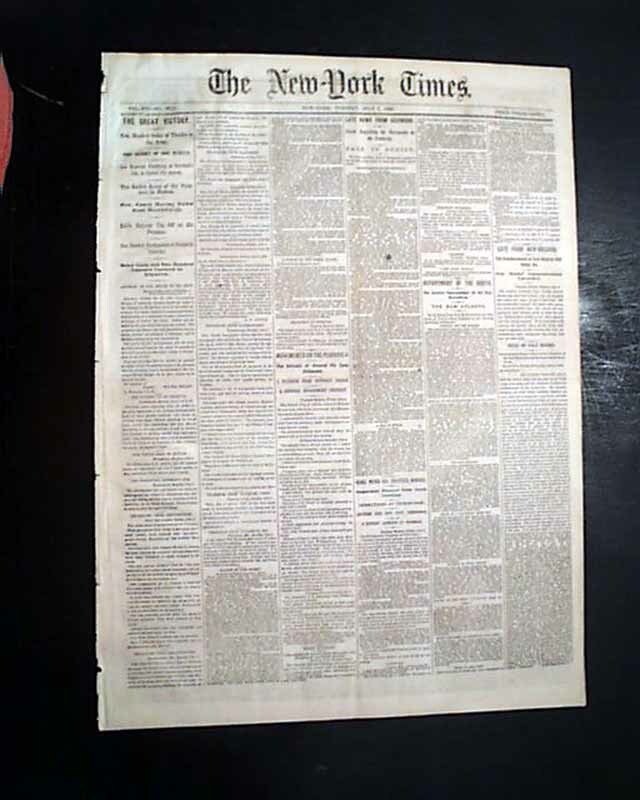 Complete in 8 pages, very nice, clean condition.